4-axle diesel engine class V100 of DR (fallen flag railroad operator in former East Germany), presented in red color with one white stripe. The DR class V100 (redesignated as V110 in 1970), is a four-axled diesel-hydraulic locomotive for medium duties operated by the Deutsche Reichsbahn of East Germany. Locomotives of the type were also supplied to railways in China and former Czechoslovakia and to various industrial operators. 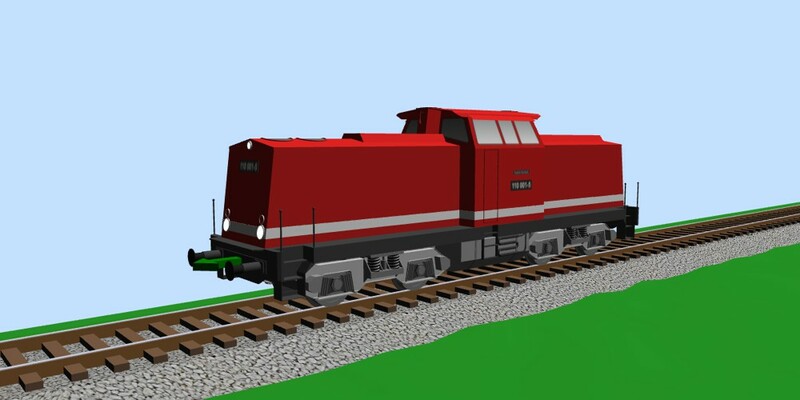 The proposed design features a four-axled diesel locomotive with a central driver's cab and hydraulic transmission designed by Lokomotivbau Karl Marx Babelsberg. The first prototype (in blue livery) of 1964 still had the well-known 900 hp (671 kW) engine from the V180 series, but the second prototype in 1965 (in red livery) was given the new 1000 hp (746 kW) engine of Type 12 KVD 18/21 A-3 from VEB Motorenwerk Johannisthal. The virtual model for SCARM MTS is based on mixture of details, taken from the prototype drawings and real scaled model in TT (1/120) scale, produced by Tillig. All major dimensions are preserved and most notable details are represented in the virtual model.